This small children’s book is a great addition to Native American folk literature. It reads like an oral story that has been converted to a children’s book. Its language is simple, its imagery is strong and clear, and there is a good dose of Native American words in the book. The plot is quite simple as well, revolving around a young girl understanding how her behavior affects others. I see this children’s book falling into a few categories . One is as a read-aloud by a parent or classroom teacher. It would be excellent for second grade homeschool, Waldorf school, or other setting, as it presents a moral tale without being heavy handed. It is also short enough to be a first-chapter children’s book, but I hesitate to recommend it that way until I see how a young reader would work with it. Sometimes short, simple books are just the right thing to get through a long car ride, rainy day or other setting. This children’s book does not involve much conceptual thinking. 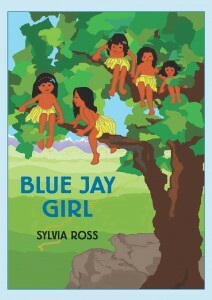 However, the content is sometimes subtle as we watch Blue Jay Girl try and figure out how her actions might change for the better. I appreciate the addition of the book to our study of Native American life and thought. Since the oral tradition is so important in Native American life, it would be lovely to have children turn this into a play that they could act out, or have the teacher tell the story rather than read it.